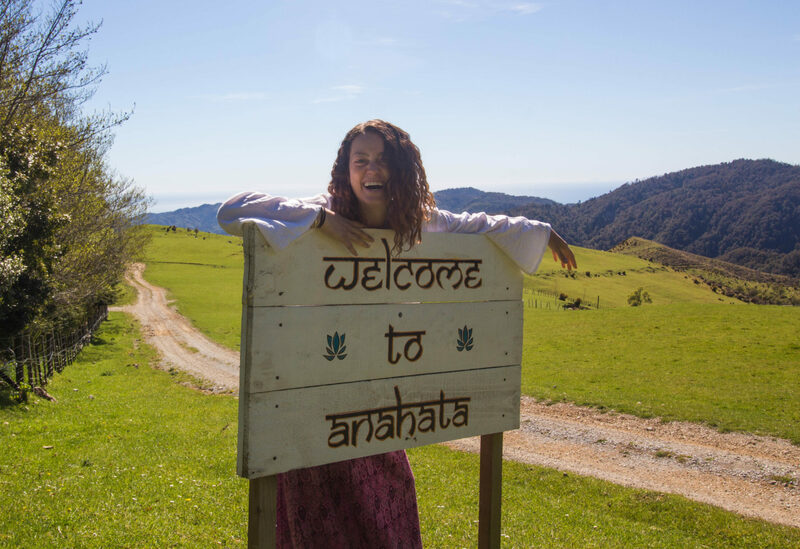 Anahata Yoga Retreat offers a sanctuary space where people from all walks of life can experience authentic yoga, yogic living and learning how to find balance in daily life. It’s the go-to yoga retreat for an authentic yoga experience, and a gentle stepping stone for anyone wishing to sample traditional Indian ashram living. 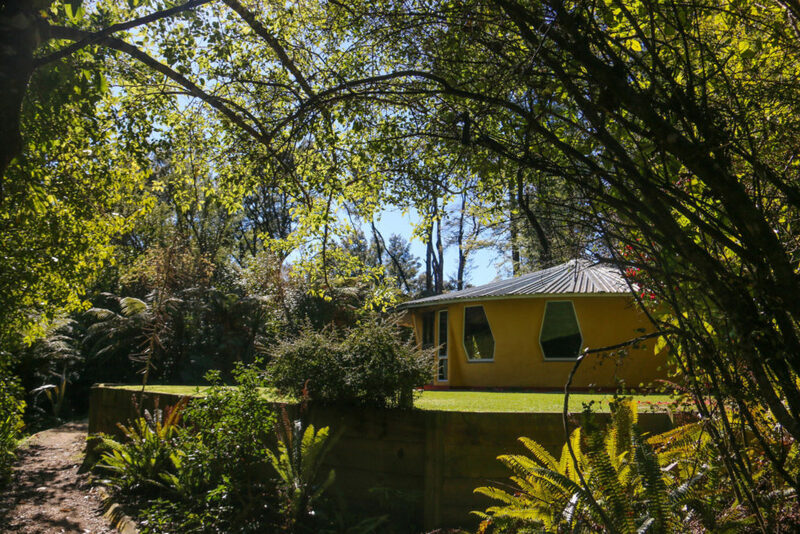 Anahata Yoga Retreat is based on the principles of ashram living. An Ashram is traditionally a place dedicated to personal transformation through yogic practice and self-enquiry with the support of a community of aspirants. This means Anahata follows the Yamas & Niyamas (social and personal codes of conduct), residents practice karma yoga (action with awareness), mouna (sacred silence) and the center is mainly run by volunteers practicing selfless service. What is truly unique about Anahata, is the living community of dedicated Swamis and Sannyasins who have dedicated their whole life to studying and sharing yoga and yoga lifestyle. You get the incredible yoga classes taught by committed teachers, vegetarian food and calmness of a normal yoga retreat centre but because of the principles and practices we follow, you experience the true, authentic yogic lifestyle experience. 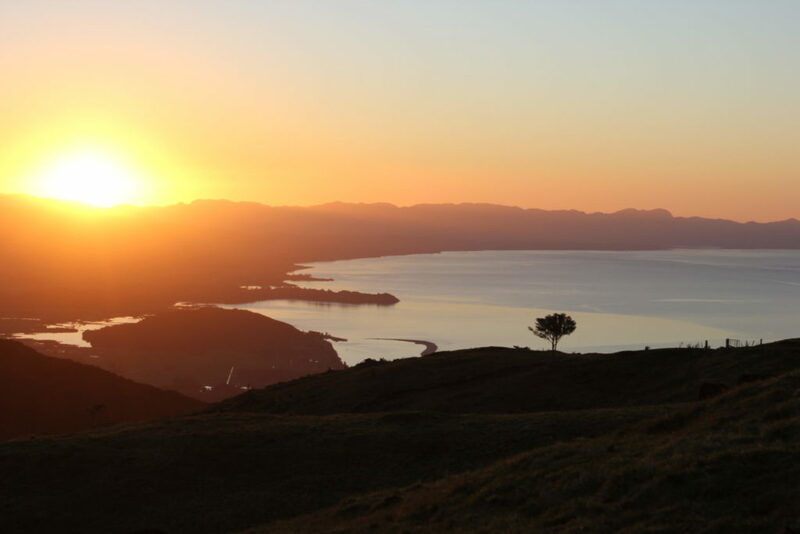 Anahata is located on the top of a crystal mountain in beautiful, sunny Golden Bay, New Zealand. When you drive 30 minutes to get to the top of the hill, you see gorgeous views of the bay and feel completely immersed in nature. It is surrounded by luscious native bush with various bush walks, waterfalls and vast open spaces. Due to the remote location, it allows you to connect deeper to yourself and to the pure nature you’re engulfed in. That means less cell reception, stressful traffic and noise pollution – how refreshing! If you ask anyone that’s been here, they’ll tell you Anahata feels like a heavenly oasis of natural peace in the heart of New Zealand. Every day we practice Yoga Nidra or yogic sleep which brings you into a state of deep relaxation. It is a meditative, yogic practice where you lay in shavasana (flat on the back) and you are systematically guided throughout the 30 minute practice to a state we call pratyahara (withdrawal of the senses). It’s everyone’s favorite practice here because of how completely at peace, calm and relaxed you feel afterwards. It can be extremely life changing as well like it was for our beloved resident Devpriya. Read about her transformation from panic to peace here. If you want to learn more & experience the depth of this powerful relaxation practice, come to the Yoga Nidra & Restorative Yoga Immersion – 5 Day Retreat on 4-9 April, 2019. Everyone who comes to Anahata is seeking something. Whether it’s time out from a busy work life, to find deeper meaning in their life, expand their yoga practice, seeking a spiritual sanctuary and supportive community, or to live a completely different lifestyle. We all come together with a desire to grow, learn and explore, which makes it easy to connect with one another. To keep the energy and connection flowing, the resident community engages in the daily yogic practices and schedule even when there is not a retreat on. Swami’s and Sannyasins who have spent years living yoga are available to share their experiences and guidance as well. You are completely supported by the community and a lot of people say they feel free to be themselves. People leave Anahata with a full heart of new connections and long-lasting friendships. In this way, coming to Anahata is like coming home. There are many different types of retreat experiences offered here throughout the year. If you are entirely new to yoga, our signature weeklong Explore Yourself Retreat may be just what you are looking for. If you are wanting to deepen your yoga teaching qualifications, you can participate in the Yoga Nidra & Restorative Yoga Teacher Training. 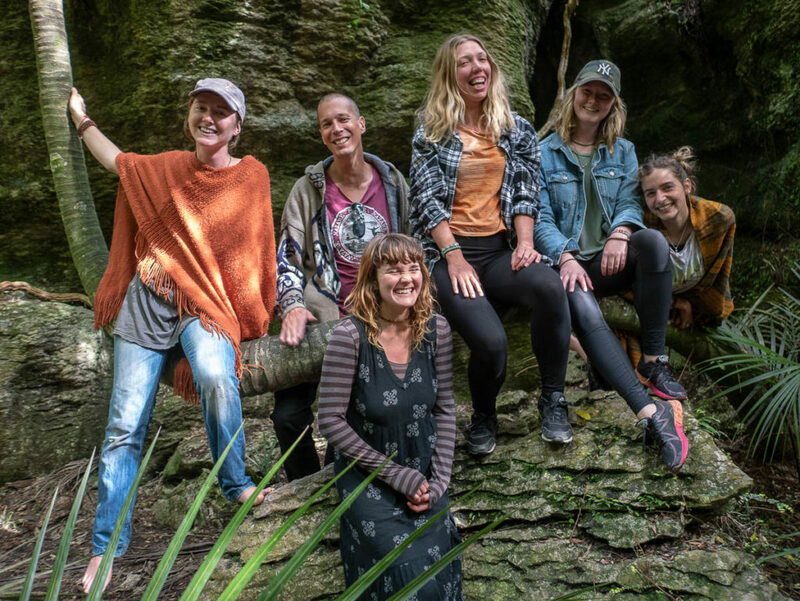 If you are passionate about combining the outer ecology (permaculture) with inner ecology (yoga), you can take part in the Yoga & Permaculture Design Course Retreat. We also have Detox Retreats, Chakra and Prana guided retreats in India, Dance of the Elements & Silent Meditation retreats. There is seriously something for everyone here. Bhakti Yoga! Every Wednesday, people at Anahata sing, chant, dance, play music and connect to their hearts during kirtan as part of our community Yoga Buffet. Local residents from Golden Bay and other travelers, join us on the hill for the weekly kirtan. Kirtan is a form of Bhakti Yoga which is known as the yoga for directing emotions and is usually singing mantras in a call and response fashion. 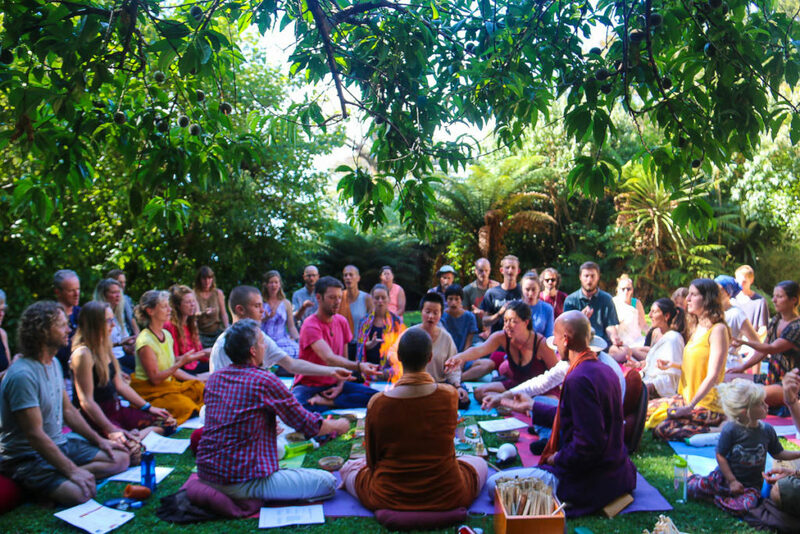 Singing kirtan together unites everyone through voice and expands our heart. The group energy created through music can be extremely powerful and sometimes everyone is up dancing like they’ve never danced before! Watch this inspiring video of the 5 hour Akanada Kirtan from New Years Eve and you’ll know what we mean. 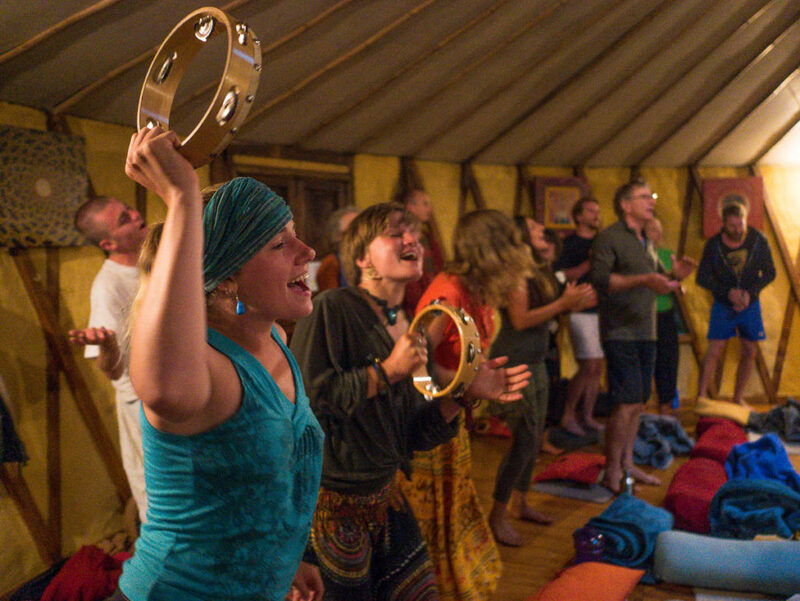 Kirtan is one of the most loved weekly sadhanas practiced here due to the freedom of expression and connection experienced. If your’e in the area, join us on Wednesdays and open your heart to the love within you! At Anahata we have two havans a week which is an ancient fire ceremony performed to invoke and connect with nature and the cosmic energies. On Saturdays in the Satyananda Yoga Tradition all over the world, 108 rounds of the Maha Mrityunjaya Healing Mantra is chanted to offer healing, abundance & peace for all. We read the names of all those we know in need of healing before making offerings to the fire with those names in our hearts. The vibrations of the mantras enhance the beneficial effect of the healing herbs that we offer to the fire as well. This ritual not only benefits the external environment, the participants of the havan also benefit as purification takes place in each individual’s internal environment as the vapours of the herbs and mantras permeate the physical, mental, emotional and spiritual entity. It is a very powerful yogic practice of healing and transformation that you must experience at least once in your life. As mentioned, on Saturdays we have a havan followed by a heart opening kirtan that all are welcome to join. The evening also includes a hatha yoga class and cooked dinner. We’d love to see you there! Anahata was built with the earth and land in mind so we can live sustainable. One of our core principles is to be in harmony with the earth, just as much as we aim to be in harmony with our bodies and minds. This is why we use solar power, composting toilets and we have our unique eco-friendly earth and straw buildings. We also care deeply about the forest, flora, and fauna of the land so we take into account environmental impact of new buildings or developments. This makes Anahata stand out from other places because of the deep connection we have with the land – working together as a holistic ecosystem of plants, humans, and dwellings. We also have organic gardens, greenhouses and polytunnels. The garden has a wide range of herbs, vegetables and salad greens that we use daily in our delicious vegetarian meals. 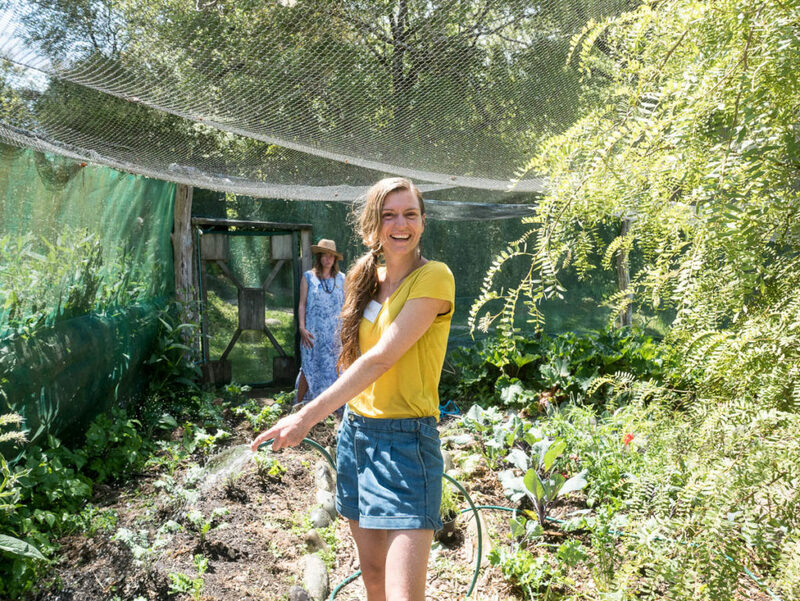 It not only allows us to have our very own fresh, healthy food, but we get the opportunity to ground and connect to the earth through gardening as well. There is nothing but smiling faces when we serve a huge bowl of kale, arugula, cabbage, zucchini and carrots all from our garden! From 8:30pm to 8:30am we practice Mouna which is sacred silence. During this time we don’t speak, talk or communicate with each other in any way. It is an amazing opportunity to turn inwards and create space for yourself to reflect, relax and still the mind. You observe the activity of the mind without getting involved in it which allows you to be the witness. This evolves deep inner listening where you can experience total peace and harmony. It’s so special to have this quiet time because in daily life we are bombarded with external noise whether it be from our cell phones, kids, work responsibilities, etc. Silence creates stillness in the mind, and we could all use some of that. The final reason Anahata is unique is because of the daily Karma Yoga. Karma Yoga means action with meditative awareness. During Karma Yoga, residents are witnessing and being present with their daily activities, while remaining unattached to the results. It is optional for guests, but we welcome everyone to join us in learning skills to be present in each and every action of life. Some of the Karma Yoga activities at Anahata are cooking, gardening, housekeeping, marketing, maintenance, etc. We learn to see all these actions as an opportunity for reflection, growth and see “work” in a new light. This practice is extremely helpful for going back into the “real world” of work, deadlines and responsibilities. You notice old patterns that don’t suit you anymore and learn to respond instead of react when these may come up. The attitude developed during Karma Yoga can help transform daily living into conscious living. These are only 10 reasons why Anahata is a unique place to retreat, get-away and live. In reality, there is so much more Anahata has to offer but this must be experienced for yourself. If you are even slightly curious of what it means to live yoga, we encourage you to visit Anahata for a personal retreat or our signature Explore Your ‘Self’ Retreat. Our aim is to bring people together to transform their lives under the unifying lifestyle of yoga so we are always here ready to greet you with an open heart and a warm welcome. We hope to see you soon!